Thank you for using our plugin. If you have any questions that are beyond the scope of this documentation, please feel free to request support at our Support Forum. Thanks so much! Do you want to display price as multi currencies on your shop page? Do you want your site to autodetect customer’s country and display price as their native currency? Do you want to accept payment in customer’s native currency? Woo Multi Currency will help you with all these things. 1. Plugin WooCommerce 3.2 or newer is installed and activated. 2. Make sure that those limits to a minimum as follows in order for free-trouble while installing. Get the plugin installation package from your account download page and save it to your desktop. 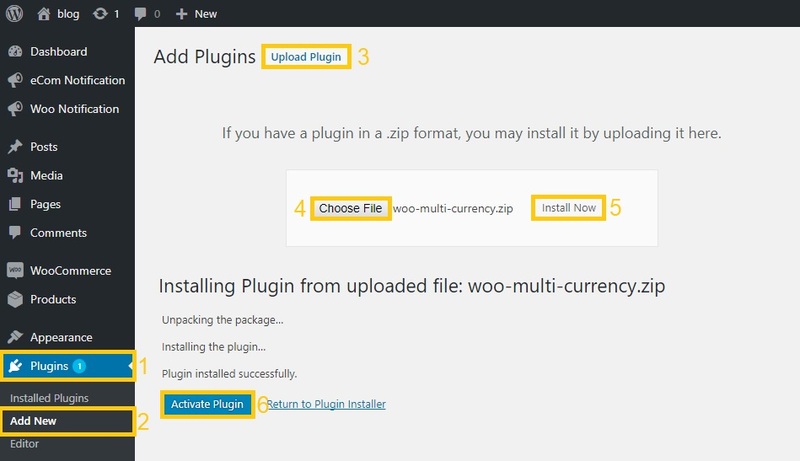 Go to Plugins/ Add New/ Upload Plugin/ Choose file/ Select woo-multi-currency.zip file/ click “Install Now“/ click “Active plugin“. After installing the plugin, please go to Dashboard/ Multi Currency/ General to set up your currencies and exchange rates. Then there should be a currencies bar appear on your site, allowing customers to switch between currencies. Fixed Price: The plugin allows you to enter custom prices in different currencies for each product. This custom price will overwrite the price calculated by the exchange rate. You can enter fixed prices in product edit pages. Use SESSION: By default, the selected currency will be saved in cookies. Turn on this option will let the plugin save this information in session instead of cookies. This option is useful for websites with cache, where the selected currency change back to the default currency after reloads. No – disable this option. Default Currency: The default currency will appear on your site if no auto-select option is enabled. Hidden: This option allows you to hide some currencies which you don’t want to appear on front-end. By selecting Yes, you will hide that currency on front-end. Position: Select how will prices be displayed on the front-end. The price before the symbol, the symbol before the price, with or without space. Rate and exchange fee: Rate can be entered by yourself or the plugin will automatically fill in. The exchange fee can be changed by you only. Number of decimals: Select how many numbers will be displayed after the command in each currency. Update All Rates: Update exchange rates of all your currencies. Add Currency: This button will duplicate your last currency, then you back to option 6-Currency to select a new currency. In Location tab, you can set up the plugin to automatically select currency base on customers’ country or language. – Auto select: Auto detect currency base on country of customers. The plugin will detect customers country base on their IP Address. Then select currency which you assign in option 4 of this tab. – Polylang: Auto select currency base on Polylang language. – WPML: Similar to Polylang but base on WPML language. Geo API: The Geo API you want to use to detect customers’ country. There are 2 options WooCommerce and External. Currency by Country: Work with Auto Detect turned on. Select which currency will be displayed for customers from which countries. In Checkout tab, you can select which currencies will be able to check out. And which payment methods are able to check out with each currency. Enable/Disable: the option to change currency to available checkout currency in the checkout page. Enable Cart Page: Change currency in the Cart page to check out currency. Default currency: The default currency on the checkout page. When the selected currency is not available for checkout. The currency on the checkout page will be forced to the default checkout currency. Select which currency is available for checkout. Payment methods: Select which payment methods will be available on the checkout page for each currency. 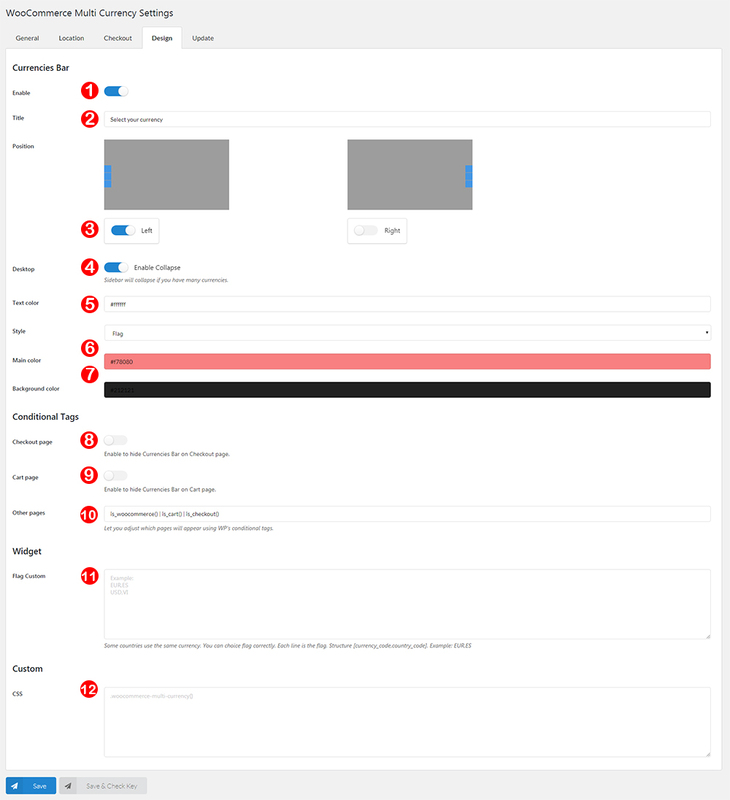 Design tab, where you can configure the front-end interface of the plugin. Enable/Disable the currencies bar. The bar float on a sidebar of your site, allows customers to switch currencies. Enter the title of the currencies bar. Currencies Bar Collapse: this option allows you to minimize the currencies bar on desktop. The currencies bar will appear as 1 selected currency and will display full when customers hover their mouse on it. Select the color of currency bar text. Select the style of the currencies bar, there are 4 options for you to select: Default (Currency code), Symbol, Flag, Flag & Currency Code, Flag & Currency symbol. Configure the color of the currencies bar. Enable to hide currencies bar on the checkout page. Enable to hide currencies bar on the cart page. Configure where will the currencies bar appear by using WP conditionals Tags. Flag Custom: The option for you to replace a flag with your own flag. Custom CSS: Allow you to add your own CSS code to design the currencies bar or widget. In Update, you can find options about the auto-update currency exchange rate and the plugin. Finance API: Select where exchange rate will be got. From Google or Yahoo. Emails: Enable this option to receive an email whenever exchange rates are updated successfully. Email Custom: When you don’t want to receive updated exchange rate email in admin email. Purchase Code: Fill in your Envato purchase code to auto-update the plugin feature.